As the new year gets underway, the biotech sector continues its annual tradition of kicking things off in San Francisco at the J.P. Morgan Healthcare Conference. This is the biggest and most important gathering of companies, investors, the media, and pretty much anyone else who is even loosely associated with the sector. 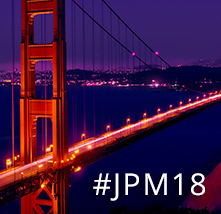 If you aren’t at JPM in January, you probably aren’t in biotech. Here at the Cancer Immunotherapy ETF (Nasdaq: CNCR), we wanted to alert our investors about this event given its substantial significance. JPM is always newsworthy and often stock moving. 2018 is the 36th annual running and it officially takes place January 8-11. Our research team will be following events closely and listening for breaking news that might impact the cancer immunotherapy sector. So what is JPM? And what are important things to focus on? There are three main things we recommend keeping in mind. First, JPM is the place biotech companies go to do dealmaking. It is not uncommon for companies to announce new collaborations and partnerships around the conference. Additionally, business development teams and other industry executives will be hard at work on the ground scouting out potential new deals for 2018 and beyond. Second, JPM is a time when many biotech companies seek to make a splash in the news. One thing we recommend is to look for announcements the night before the conference starts (January 7) because some companies like to get ahead of the news cycle by issuing press releases early. Others will wait to make announcements at various times throughout the conference itself. Third, JPM is a place for companies to give public presentations where they discuss plans for the year ahead. These are great for investors to listen in on because you get a chance to hear straight from leadership about their priorities. Companies usually also provide a tangible list of catalysts or other guidance that you can use thereafter to track their progress. Below is a schedule that shows what time CNCR Immunotherapy ETF (Nasdaq: CNCR) components are due to give a formal presentation at the conference. All times are Pacific, and the schedule is subject to change. If you are interested in hearing what a particular company has to say, we recommend visiting the investor relations section of its website because many will webcast the presentation and some also do the same for Q&A sessions that follow afterwards. Thank you for your interest in the field of immunotherapy and support of the fund. We wish you healthy and prosperous 2018.